Please click top right button for detailed information, photo story. Monk Jakushō (also known as Ōe no Sadamoto before he renounced the world) is traveling around China and India visiting the places associated with Buddha. One day he arrives at a stone bridge in Mount Shōryōzen in China (located in the present Shanxi Province). A woodcutter boy appears. The boy exchanges words with Jakushō and tells him that the land beyond the bridge is the Pure Land belonging to Monju Bosatsu (Manjusri Bodhisattva) and that crossing this long, narrow bridge arching over a deep gorge is not easy for humans (indicating the difficulty of Buddhist ascetic training). The boy predicts that the monk will see a miracle if he stays at the bridge, and then he disappears. From the other side of the bridge there comes to the waiting Jakushō, a lion (or lions), messenger of Manjusri Bodhisattva. The lion plays with gorgeous, fragrant peony flowers. After dancing a lion dance, the lion returns to his designated position, which is the carrier of Manjusri Bodhisattva. Shakkyō is a kirinoh, or the last piece performed in the entire Noh program. 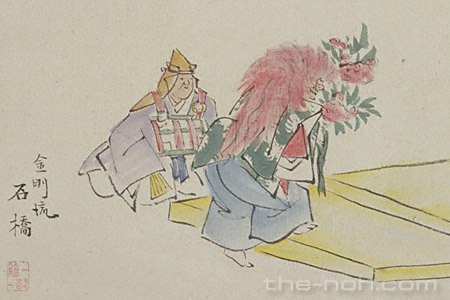 This piece describes auspiciousness and includes a unique Shishimai, or lion dance. The lion dance is considered an advanced skill which requires special forms, movements, and expressiveness. Therefore Shakkyō is classified into one of the hiraki-mono. Hiraki-mono is a kind of an initiation ceremony in the Noh world, which demonstrates that the performer has reached a specific level of learning in his or her Noh training. Parts of staging differ by schools; while the other schools position the boy as mae-shite (the first half lead part) while the Hosho school positions him as tsure (the companion of shite). Also, the Hosho school omits ai-kyogen (interlude). Under modern theatrical circumstances it often happens that only the second half of this piece is performed (han-noh). Renjishi or the lion dance by two lions is also a popular way of staging in many schools. The highlight of this piece is the extraordinary gorgeousness of the dance. It will fill the audience with brightness and briskness. Since even novices to the Noh art can straightforwardly enjoy this piece, it was performed to entertain distinguished guests from overseas. 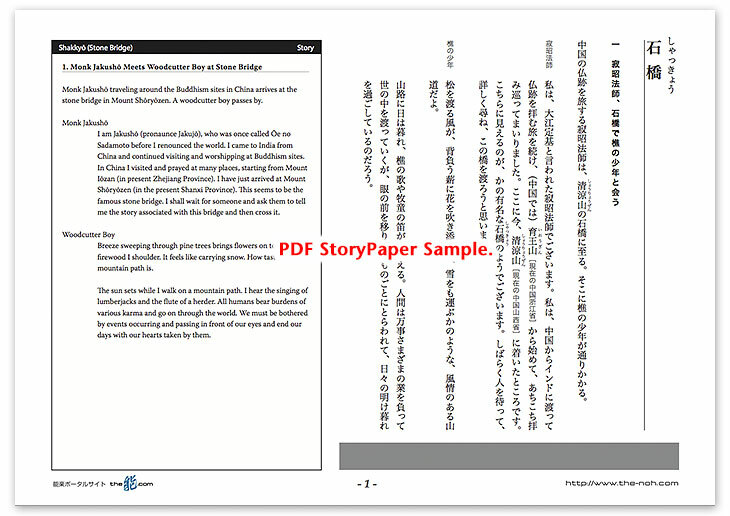 Story Paper presents noh chant stories in modern speech, with story outlines, highlights and more using Adobe PDF format, which can print out and zoom in. Print out the pages and take them with you when you see the actual noh performance. The copyright of Story Paper is held by the Noh.com. Story Paper is for individual use only. It is prohibited by the copyright law to distribute or publish printed-out Story Paper pages without prior consent. For more information, check the credit and disclaimer pages.